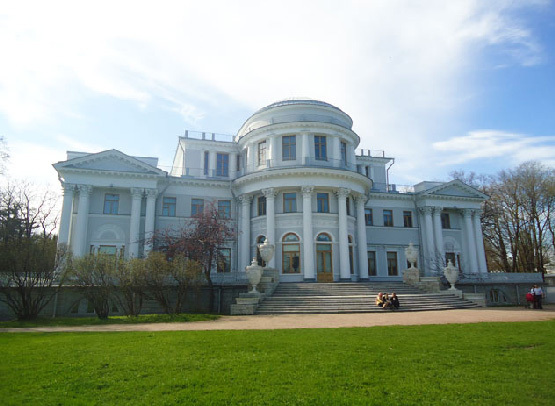 Yelagin Palace completed in 1822 is a palace in Saint Petersburg which is situated on Yelagin Island in the Neva River and served as a royal summer palace during the reign of Tsar Alexander I. 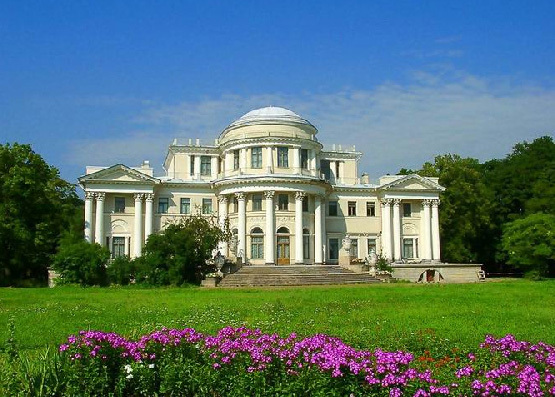 Constructed on the site of an earlier mansion built during the rule of Catherine the Great, the villa was designed for Alexander’s mother, Maria Fyodorovna, by the architect Carlo Rossi. The palace was destroyed during World War II but was rebuilt and currently houses a museum. The construction of the new palace in place Elagina old was entrusted to Carl Rossi, who at that time was not yet as famous as after the construction of the Mikhailovsky Palace and later named in his honor Ideal Street, the construction of the Winter Palace and the General Staff Building on Palace Square. In fact, the creation of the ensemble on Elagin Island was his first major work in St. Petersburg. In addition to the new three-storey palace, crowned with a dome, Russia will build three additional pavilions, as well as kitchen and Stables body, but he has placed all these buildings so that in the end turned out a brand new, beautiful image of the mansion. For example, from greens pulled neozhidenno semicircular facade kitchen, from which peep semicircular niches framed aprons statues, behind which lurk in the corridor kitchen window. The mansion is a two-story, rectangular building. He stressed the primacy of the high stylobate on which the house stands. The front facade is decorated in the center of the six-Corinthian portico, facing the meadow. A wide staircase decorated with iron lions and balls. These were the first sculptures of lions of St. Petersburg, who subsequently became one of the symbols of the city. Ceremonial decorated and the opposite facade, overlooking the river. A semicircular staircase decorated with marble vases and decorative iron flower baskets. Very close to the palace situated Kitchen Building, decorated on both sides with Doric six-columned portico, and a little farther – Stables. Further along the alley – Music Pavilion. It is located on the coastal avenue of the park, which was also used by the hosts and guests and has been designed for wind orchestra. The most beautiful and spectacular room on the first floor – a central oval hall with Ionic semi-columns and caryatids that support the dome, decorated with ornamental paintings. Adjacent to the hall are the dining room, bedroom and office, as well as Crimson and Blue room. The decoration was attended by sculptors SS Pimenov and VI Demuth-Malinovsky, painters J. Scott and B. Medici and others.